All customers who send us an email before November 1, 2017 will receive a special offer for them to enjoy on our Christmas Décor! We are happy to be extending our product offering to include Christmas Décor for you! From Trees, to Wreaths to Planters! 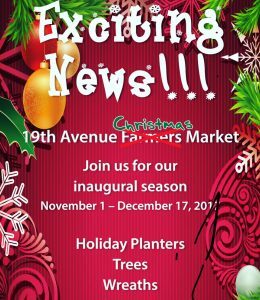 Be sure to stop by and visit our market between November 1, 2017 and December 17, 2017!